For the last few days the news seems to have been full of the autumn ‘heat wave’ and record temperatures for September and October. That’s all very well if you’re one of those folk living in England or Wales…if you live in Ayrshire and no doubt much of the west of Scotland or Northern Ireland…well, it’s not been quite so good. 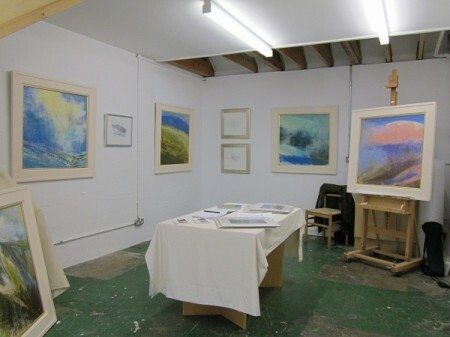 As you know from my previous blogs and posts on Face Book, this weekend is the WASPS Studios Open Weekend and yesterday I awoke to find the skies dark and the rain teeming down. And it didn’t get any better through the rest of the day..it just rained and rained and rained. 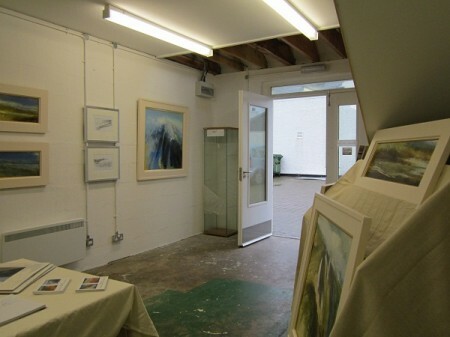 Not surprisingly visitor numbers were down ….well, they were the worst at the Courtyard for any single day since we started the Open Studios Weekends six or seven years ago. I’m not sure of the exact number but it was in the region of 35 I guess. Seeing as we normally get around 200 visitors over the two days we’ve got a lot of catching up to do today. However, considering the day long deluge, it really was quite good that we got 35 visitors yesterday and everyone who donned their hats and coats and came down to the studios deserves a medal I think …so a big thanks to all of those. When I got up this morning at about 06.45 it was still chucking it down with rain and as the light increased, things looked no different from yesterday! However, it’s now about 08.45 and I do believe it’s just stopped ..I can hear some birds singing in the garden so perhaps they sense a change to slightly better brighter conditions later in the day …let’s hope so. The studios are open again today from noon until 5pm so with a bit of luck we’ll see a lot more people this afternoon. The weather though isn’t the only thing to change this week. Last weekend I arrived at my studio to find a very bad pong emanating from somewhere under the floor boards or from behind a wall cavity. Very unpleasant and I had to work all last weekend with the front door wide open. As I said to a couple of local ladies who stopped to look in through the front door, ‘I think we have a dead ‘mouse’ under the floor boards’. As the weekend progressed it became patently obvious that the ‘mouse’ should have been spelt ‘rat’! Ahhhhhh. Thankfully, there are several empty studio spaces at the moment and head office agreed for me to move into one of these temporarily while they decided what to do …and most importantly, for the period of the Open Weekend. So, much moving of gear, especially as builders arrived on Wednesday to take up part of the floor in search of the culprit….which they couldn’t find. Since then, the pest man has been, the builders have been back again and the architect is now involved. It really is a case of trying to find how the thing got into the wall or floor space. Oh well, as one of my colleagues said, ‘every rat has a silver lining’! 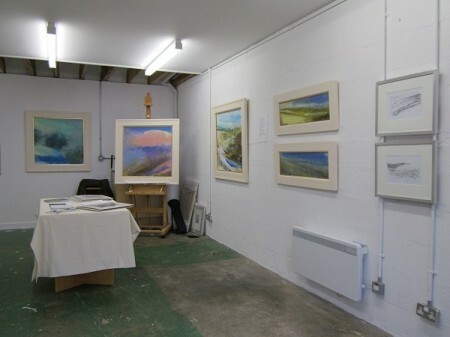 The studio I moved into for the Open Weekend, is superb. It’s in the main courtyard and is twice the size of my current space. Within a day of moving in, I realised that I wanted to make the move permanent. I’ve been doing this slightly larger work this summer and Studio E was becoming very congested with all the paintings and materials. Perhaps I shouldn’t have tried ‘swinging that cat’ the other week …it might have caught the rat! Anyway, to cut a long story short …I’ve asked head office to let me change studios immediately and so I’ll start moving the rest of my gear into studio J on Monday. It’s going to be great having more space although I’ll miss the wonderful view I had out over the river and saltings …but sometimes you just have to move on …and I think all things considered, that this is the right thing to do. 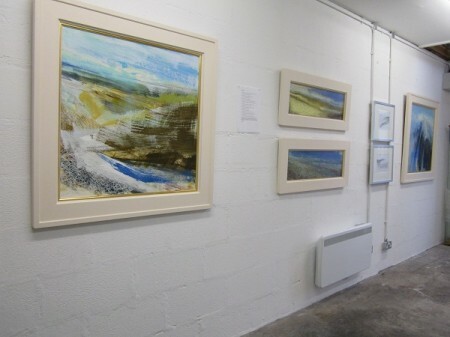 The work looks great on the wall so hopefully a good few people will get to see it and the new studio, later today. Oh, and by the way, for all of you down south in your shades and flip flops …have pity on us up here …it’s just started raining heavily again!